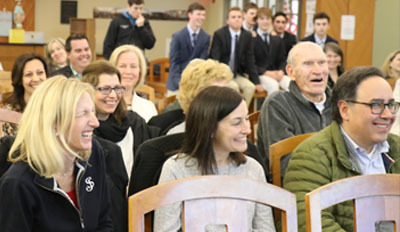 Thirty students, nine teams, five judges, and a host of parents convened in the Prep’s A. E. Studzinski Library on Tuesday for the shark tank event that marks the culmination of the Ryan Shaw ’15 Entrepreneurial Leadership Program. This year’s round of student-entrepreneurs came up with such promising ventures that four teams were selected to advance to the Boston Babson Cup competition on April 26. The quartet of new ventures included Tru-ber (an app that connects people who need to move single piece of furniture with a local driver and truck), Hive (a temperature-controlled locker for food deliveries to offices and/or public spaces), Bag-Seal (a nylon cover designed specifically to keep backpacks dry on rainy campuses), and WeconnectU (an app that makes it easy for college freshmen to organize social events in tandem with their school’s social calendar). More photos on SmugMug. Well prepared and articulate, all nine teams pitched ideas that ranged from community-building apps to an innovative solutions for everyday problems. All of the ventures had to be actionable in six months, and each team had three minutes and three slides to present their idea before taking questions from the judges. The program, which is designed to foster entrepreneurship and venture creation, is named for the late Ryan Shaw ’15, who participated in the program as a student at St. John’s. “I’m extremely proud of the whole group. This started back in January, and despite the challenges and extra work it takes to turn an idea into an actionable item, they stayed with it. 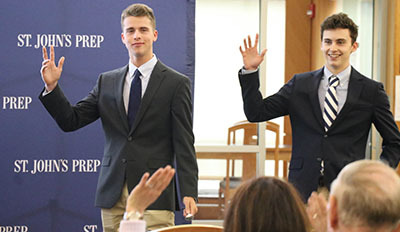 It’s a tough track, and we’re proud of how hard they worked to get where they did,” said David Hennessy ’83, economics teacher at St. John’s who moderates the program. Special thanks to Curt Dalton '92 who co-moderates the program with Mr. Hennessey, and to our panel of expert judges: digital entrepreneur Erich Archer '99, economics teacher Anne Gamer, math teacher Jessica Livermore, Babson College's you program coordinator Joseph McNamara, and campus minster Rob Tyler.